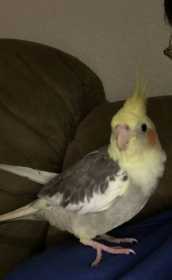 Our Cockatiel flew away from the house on 9/23 about 5:30 PM ago near Feronia St and Phosphor Avenue. Wind was blowing toward West Esplanade At the time but by now he could be anywhere around the New Orleans or Metairie area. His name is Jason if you see him. Please call 504-722-5080 or 504-982-8581.